2. You can easily generate the reports with the information you need, so you always know where your business stands. You instantly know whether you’re making money and whether your business is healthy. 4. Your business can grow with Quickbooks. It will help you design a business plan to use when trying to secure a small business loan or line of credit or to plan for the future. It will create a projected balance sheet, profit and loss statement and statement of cash flows in the format recommended by the U.S. Small Business Administration. 5. You can customize Quickbooks to work the way you want. It is specifically designed to be flexible and adaptable to a wide range of small businesses. 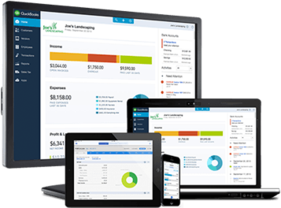 To broaden its appeal to Quickbooks has recently added customized accounting packages for Contractors, Retailers, Health Care Professionals, and Non-Profit organizations. 6. You can rest assured knowing that Quickbooks is a stable, reliable and proven product. Hundreds of thousands of small businesses throughout the world have chosen it as their accounting software. You can’t go wrong with a software program with such an extensive installed user base. 8. You will get paid faster with Quickbooks online payments. E-mail an invoice or statement and with its Online Billing, your customer can easily pay you with a credit card or bank account transfer. No more waiting for the check in the mail! 9. You can easily accept Credit Cards. With Quickbooks Merchant Account Service, you can accept credit cards with ease. Its Merchant Account Service is the only credit card acceptance service integrated with the software, which means you don’t have to enter the same data twice. No additional software or hardware is required. Your customers can use Visa, MasterCard, or American Express. 10. You can pay your bills and bank online. Setup your current bank account in Quickbooks, and you’re ready to pay your bills without licking envelopes, sticking stamps, or printing paper checks. Just write checks as you normally would, then click a button and your participating bank does the rest! Pay anyone in the U.S. from your credit card companies to your pizza service. Online Banking also lets you download your monthly statement from your participating bank directly into Quick Books for easier reconciliation.